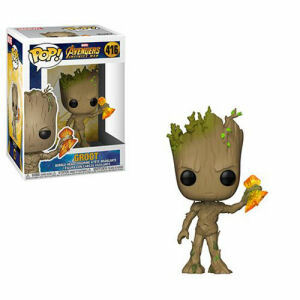 We have Just Sold out of Avengers Infinity War Groot with Stormbreaker Pop! Vinyl Figure #416. Not to Worry! Fill in the Notify me When Available and you will be the first in line for our restock of Avengers Infinity War Groot with Stormbreaker Pop! Vinyl Figure #416 !! From the Avengers Infinity War Pop! Vinyl collection by Funko. Avengers Infinity War Groot with Stormbreaker Pop! Vinyl Figure #416. Measures 3.75 inches high. The sylized figure comes in a displayable window box. Ages 3 and up.